This guide teaches Managers how to create and use Leave Types. Leave Types in TimeForge can be Location-based, Corporation-wide, or applied only to specific individuals. Location-based leave could be useful if your corporate office gets PTO but your call center doesn’t, for example. Location-based leave could also be useful if your business has locations spread across multiple states and those states have different PTO rules. In order to follow all the steps in this guide, you need to have manager-level permissions in TimeForge. While at the Corporate level, open the Set Up tab and select Leave Types from the menu. 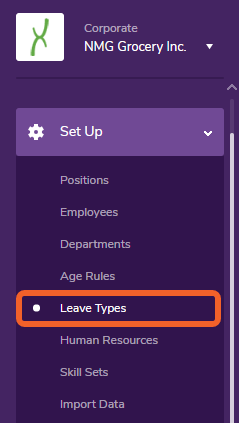 Click the + Add Leave Type button in the upper right to create a new type of leave. If you have any Leave Types in the system already, they will be listed on this page. You can also edit an existing Leave Type from here. Leave Types are very configurable and can be adjusted to suit your business needs. You can set whether and how often this Leave Type is accrued, what the maximum balance for this Leave Type is, how long after initially being hired employees have to work before starting to accrue this Leave Type, and more. Do you want this Leave Type to be Location-based? If you selected the option to make this Leave Type location-based, you should now click the Locations tab and select which locations it should apply to. If you would like this Leave Type to apply to all employees, simply use the All Employees checkbox. Otherwise, select individual employees from the list. If you selected the option to make this Leave Type location-based, you will only see employees at those locations. Click the Approval Managers tab and set your approval managers for this leave type and their permissions. Approval managers can approve or deny employee requests for leave. 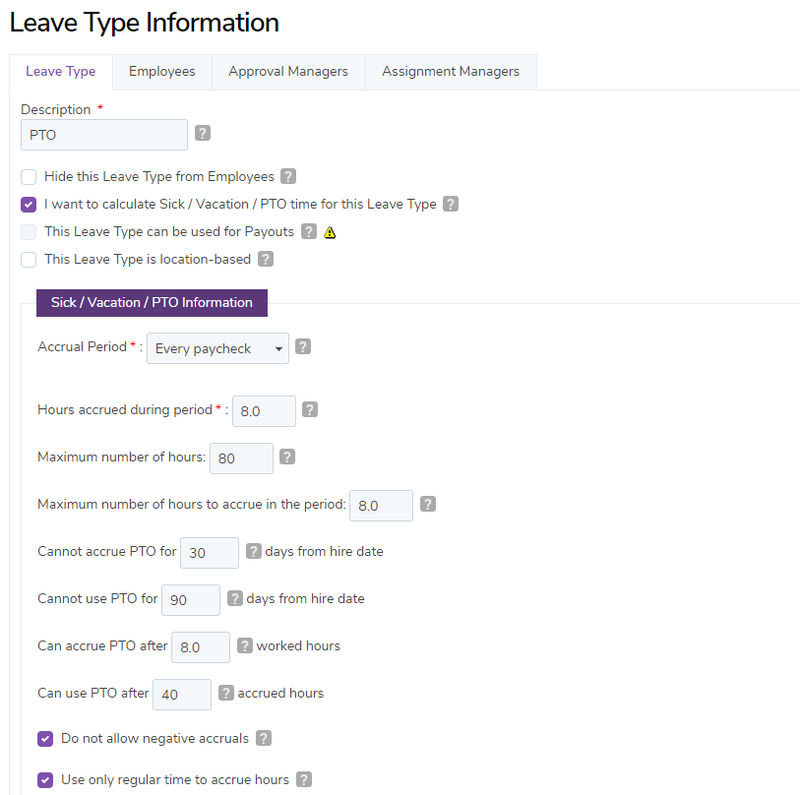 Approval Managers with Self+Others access can edit this Leave Type and approve its use for anyone, including themselves, with available hours for that Leave Type. Approval Managers with Others access can approve this Leave Type on anyone, except themselves, with available hours for that Leave Type. Approval Managers with None selected have no access to editing or approving this Leave Type for anyone. If all Approval Managers are set to None, they all can do Self+Others. Click the Assignment Managers tab and set your assignment managers for this leave type and their permissions. Assignment managers can assign this leave type to employees. This works the same way as it does with Approval Managers. The option to create Assignment Managers allows you to create users who can assign leave types for other employees without necessarily having approval access. If all assignment managers are set to none, they all can do Self+Others. Once you’re finished setting all your options for this Leave Type, be sure to click the Save button. You will be returned to your Leave Types page, and your new type will now be shown in the grid/list.